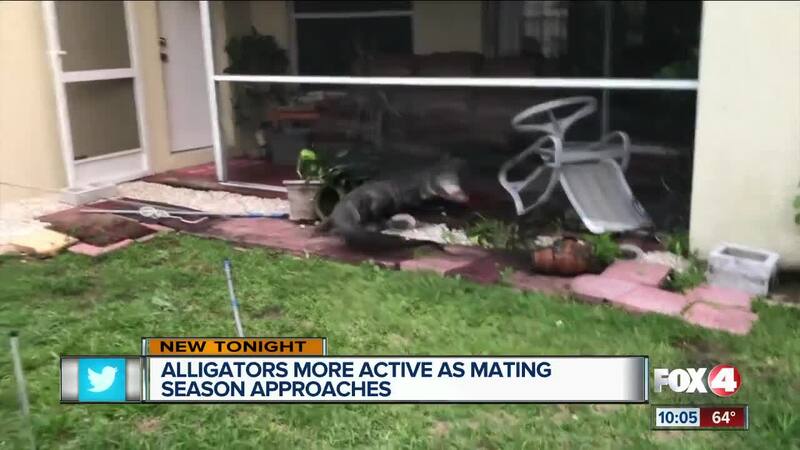 FORT MYERS, Fla. – Alligator mating season doesn’t start for several more days, but a Naples wildlife trapper said he’s already seeing an upswing in gator activity. Ray the Trapper said he has been busy recently catching wildlife. He’s trapped more than 10 gators in the past month. “I’ve personally seen a major upswing in the last few weeks. I’ve had calls with gators in front of entry doors, inside garages and swimming pools,” said Ray the Trapper. He said there was even a gator inside an apartment elevator. Some of the gators he trapped were as big as 7 to 8 feet long. “I have to be quick and swift about it, no doubt because they are feisty, and they are strong,” said Ray. Alligators are on the move as the season of love for gators gets underway. “It seems like we’ve had quite a bit of activity and I think it’s with the weather conditions because the water is low and unseasonably warm,” Ray said. Experts explain we will see even more activity entering the rainy months. “Anywhere you have standing water you have the potential to see an alligator,” said Melody Kilborn, a public information coordinator for the Florida Fish and Wildlife Conservation Commission. Kilborn encourages people to be extra aware of their surroundings from now until the end of June. “If you see an alligator, keep your distance, don’t feed an alligator,” said Kilborn. Kilborn said keep your doors shut and gates locked. Pet owners need to keep their animals on a leash and away from the water. Gators can show up anywhere so if one wanders too close to your home, the best thing to do is call a professional to remove it. More safety tips are on the FWC website .